To help reduce accident clearance times and improve safety, the Central Florida Expressway Authority (CFX) has partnered with the Florida Department of Transportation, MetroPlan Orlando, the Florida Highway Patrol, and the Orlando Police Department on a collaborative Pilot Project to research advanced technologies and methods for investigating crash scenes. 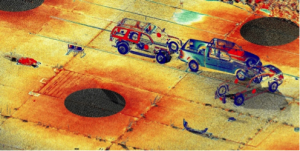 The Crash Scene Investigation Pilot Project is designed to test and verify the effectiveness of various 3D Laser Scanning products and then determine the best system for use in future crash scene investigations. 3D laser scanning uses LiDAR technology, which is short for Light Detection and Ranging. LiDAR measures distance by illuminating a target with a laser and analyzing the reflected light. The Pilot Project focuses on crashes involving fatalities – which must be treated as crime scenes. In these instances, police must document exact details of the accident site and record a wide array of information such as road conditions, position of the vehicles, occupants and debris. Traditional survey methods for fatal accidents can result in lane and road closures lasting 4-6 hours. The aftermath of a crash poses safety risks to incident responders and motorists, and increases the likelihood of secondary crashes. During the three-year Pilot Project, data will be collected on the 3D laser scanning systems which will be used for performance measure reports. At the conclusion of the Pilot Project, a final 3D laser scanning system recommendation will be made. Click here to download the fact sheet for this project.